This easy recipe for lavash, a thin, soft flatbread popular in Turkey, Iran, and other Middle Eastern countries, is made with flour, water, and salt. Lavash is served with dips like​ hummus or baba ghanoush and used for wraps and other sandwiches. In a measuring cup, combine yeast, water, and sugar. Mix until yeast is dissolved. Set aside. Add yeast-water-sugar mixture and form a dough. Knead dough for 10 to 15 minutes by hand or 5 to 8 minutes using a dough hook in a stand mixer. Once the dough is kneaded, place the ball of dough in the oiled bowl. Roll the dough around the bowl to coat it with oil. Cover and let rise for 1 to 1 1/2 hours, or until the dough doubles in size. Once the dough has doubled, punch it down to release air. Divide dough into 8 separate balls of dough. Once the balls of dough have risen, roll them out into thin rectangles, about 12-by-10-inches for large lavash or 8-by-6-inches for small flatbreads. They should be as thin as pizza dough. Transfer to parchment-lined baking sheets. Puncture the entire surface of the rectangles with the tines of a fork. Brush dough with water and sprinkle with sesame seeds and poppy seeds if desired. Remove from oven and eat while still warm or when cool. Don't wait too long to eat lavash after baking it. This bread dries out quickly and often becomes brittle and/or hard to chew. If you don't plan to eat it immediately, freeze it in a zip-top bag as soon as it cools to room temperature. Lavash is a combination of flour, water, and salt. The bread's thickness differs depending on how flat and thin you roll it out. For extra taste, you can sprinkle on either toasted sesame or poppy seeds before baking. Traditionally, lavash is cooked against the hot walls of a clay oven. Food experts believe lavash, an unleavened flatbread originated in Armenia, while other foodies claim it first surfaced in the Middle East. 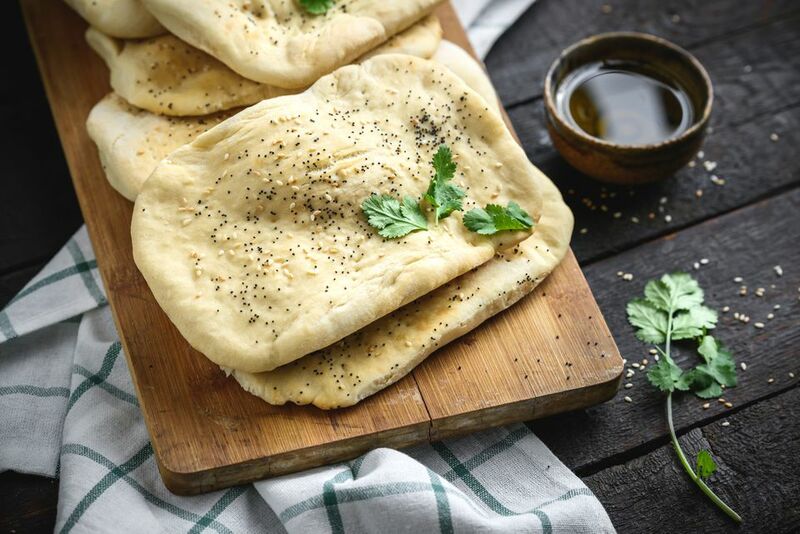 Regardless where it originated, it's now a popular table bread throughout the Middle East.